Energy drinks were popular during the 24-hour event. Katsuhiro “Don” Kondou, a 47-year-old IT specialist from Japan, barked his team’s call sign, K1O, into the microphone on his headset, trying to reach someone far, far away. Sitting beside him was Hajime Hazuki, a 29-year-old mechanical designer from Tokyo. Together, they sat in a hot tent at Wompatuck State Park Saturday morning, with headphones on and their eyes glued to monitors, trying urgently to contact other amateur radio operators from all over the world as quickly as possible. They were among the many two-person teams to compete in the World Radiosport Team Championship. It is held every four years, and participants take it very seriously. The most recent championship took place last weekend at more than a dozen locations in Eastern Massachusetts and New Hampshire. 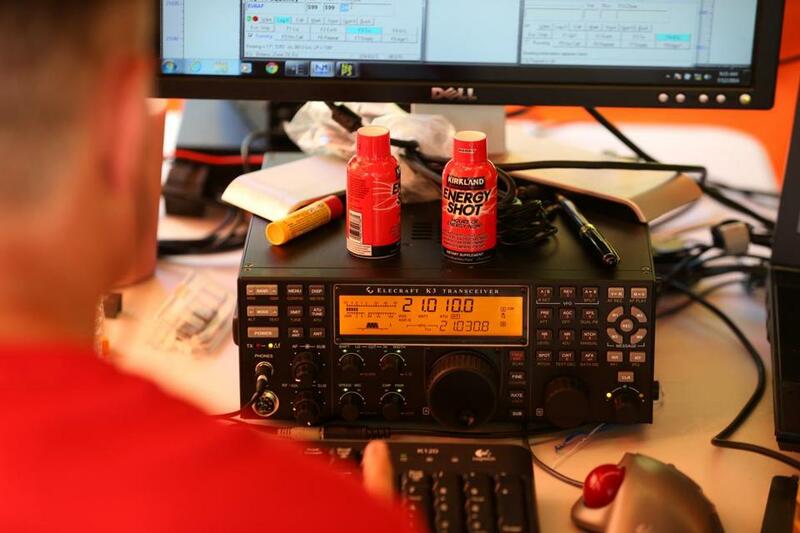 The object of the contest was simple: Contact as many other ham radio operators (aka hams) as possible over a period of 24 hours. Participants included several CEOs and engineers, a truck driver from France, a reconstructive plastic surgeon from Cyprus, a high school teacher from North Carolina, a psychologist from Romania, a bank director from Portugal, a hotel manager from China, and a retired brigadier general from the Slovenian Army. The championship is part competition, “part all-star game, and part social,” according to event co-organizer Randy Thompson, who lives in Uxbridge. 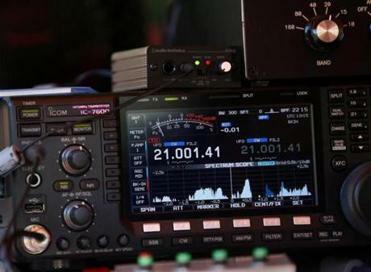 Ham radio operators talk to one another all the time, but many never meet. The championship was an opportunity for them to mingle in person. There were 59 two-person teams competing in this year’s championship. The competitors ranged in age from 22 to 70, and they were mostly men (two women competed). Since the first World Radiosport Team Championship took place in 1990 in Seattle, it has been held in San Francisco, Slovenia, Finland, Brazil, and Russia. This was the first time it was held in New England. The WRTC is by invitation only. To qualify, operators are judged by their scores from the past three years. The best operators from each region are chosen to compete, and they can pick their partners. The competitors traveled from all over the world and arrived last week at the DoubleTree by Hilton hotel in Westborough, which served as headquarters of the event. Mitch Mason, 51, came from Washington state to participate. He lives on Camano Island, north of Seattle. “There are people I’ve been talking to for years and years, and here they are, right in front of you,” said Mason, a bodybuilder and father of two who owns a travel agency. Mason got into amateur radio as a kid during the “CB craze” of the 1970s. “I was amazed at what I was hearing,” said Mason. “I found the whole thing fascinating. Mason got his amateur radio license in 1984, and began competing 14 years ago. This was his first WRTC championship. In the days leading up to the competition, he said, the atmosphere was relaxed and people were having a good time. On Friday, a drawing was held and each team was randomly assigned to an operating site in Mansfield; Wrentham; Devens; Assonet; Berkley; Carver; Cohasset; Dighton; East Taunton; Hollis, N.H.; Leominster; Medfield; Plymouth; Norwell; Pepperell; and Hingham. Tents were scattered throughout each location. Each station is set up with the exact same type of antenna system and generator. The point of being in the same geographic area and using identical antennas is to level the playing field. A referee is assigned to each team. Participants are allowed to use Morse code or their voices to exchange the information over the airwaves. The competition started promptly at 8 a.m. Saturday morning. The competitors donned headphones, put their heads down, and started contacting other hams. They worked through the night until the contest came to an end 24 hours later, at 8 a.m. the following morning. There was no stopping. No sleep. Thompson compared the event to a 24-hour endurance race. “You could take a nap, but you’re not making points when you’re sleeping,” said Thompson. The first-place winner gets a gold medal and a trophy and, most important of all, bragging rights. “Bragging rights are worth a lot,” said Thompson. The coveted title ultimately went to Daniel Craig, a 33-year-old pharmacy auditor from California, and Chris Hurlbut, a 31-year-old supermarket manager from Montana. Together, they made 4,591 contacts: 3,844 by Morse code, 747 by voice. Scott Redd, 69, former vice admiral of the US Navy and former director of the National Counterterrorism Center, was among the competitors. He got his ham radio license in 1954 when he was 10, and has won several world championships as a single operator. Redd credited the volunteers and organizers for putting on a world-class event. He even got to finally meet the Slovenian brigadier general. He and Redd used to talk to each other over ham radio decades ago. Emily Sweeney can be reached at esweeney@globe.com.